I cannot post anything on Nettie Tourville, one of Charles and Sophia Arpajou’s children, before I tell you the story of my quest for Matilda Laquire (1847-?). Used to a goldmine of genealogical information from the Quebec Catholic Records, I was at a lost with Matilda, the wife of Louis Tourville. In 1866, she had a daughter baptized at St. Patrick’s Catholic Church in Chateaugay, NY. Her maiden name was recorded as Sequin. She appeared in the 1880 US Census as the wife of Louis Tourville in Grand Haven, MI, born about 1847 in Vermont and her parents, in Pennsylvania. Never give up, I am telling you. I don’t know why but I always thought that the fact that her parents were supposedly born in Pennsylvania might be a mistake. I mean her name, Sequin, looked a lot like Seguin or Séguin, which are very common surnames here in Quebec. But as Louis fought in the Civil War I thought that maybe he met her closer to Washington, DC, in Virginia, or even in Pennsylvania. I first checked the original document from St. Patrick’s to see if there was a mistake in the transcription. Nope. I then looked for all Sequin or Seguin families in Vermont, hoping to find her in 1850 or 1860: nothing. Louis and Matilda’s daughter Lizzie died at age 1 in Grand Haven in 1869. No more clue. Next, I tried to find their daughters Jennie and Clarissa after 1880. Ah! that 1880-1900 gap! I did find a marriage for Clarissa Tourville and Edward Palmer in 1886 in Grand Haven but nothing more than that, except it confirmed that Matilda was still living in 1886 as she was one of the witnesses at the marriage. I did find an Edward Palmer in 1900 but he was married to another woman. Was he the same one? He was indeed as I found a second marriage for him in 1892 and that his obituary confirmed that he was the same Edward Palmer who married Clarissa. The Palmers’ came from Allegan County and I found the records for the cemetery family lot and no Clarissa. By the way, the Clarissa Tourville Palmer case is still cold. My first break came from my first trip to Salt Lake City. By looking at all the vital records for Ottawa County, I found the birth of Clarissa in 1869 (no maiden name for the mother) and I found a marriage for a Jennie Lovill married to a Marine Kamphout in 1883. That L from Lovill looked like a T so I decided to follow that track. I found the couple in the 1900 US Census and I found births in the vital records of Ottawa County (online) that matched the names on the census. I had no proof that this person was indeed the daughter of Louis and Matilda but I had no other clue to pursue. So I followed Jennie or Mary Jane as she was later called n the census until 1930 where she lived with her daughter in Wyandotte, near Detroit. Marinus Kamhout died in 1906 so in 1910 I found the daughters with their remarried mother in Michigan. In 1920, Mary Jane was back to the Kamhout surname. Who knows what happened with that marriage? My second big break came from the Louttit Library in Grand Haven. A wonderful woman sent me some newspaper clips (they were not online at the time) as well as a cemetery lot listing for the family. I then had a date for the death of Mary Jane! But… nothing in the Grand Haven newspapers even if she was buried there in 1953. I even ordered a microfilm through BANQ for a Detroit newspapers (one of her son died there) and I couldn’t find anything still. Have I ever told you that I have never found ANYBODY in those funeral home repertoires? On another trip to Salt Lake City, I was going through the Michigan books on the US Book Floor and I saw a funeral home repertoire for Wyandotte. I opened it and I almost screamed (I think I did)! There she was: Mary Jane Kamhout. And that funeral home index refered to a record of funeral in another book which was also on the shelves and it even looked like a DEATH certificate. Hummm! Father: Louis Detourville. Mother: Matilda LaQuire. Where is that surname coming from? I was so excited I ran to a computer to search for Laquires. First thing I noticed, some Laquires are corrected to Lecuyer and that is also a common surname in Quebec. I also saw Saquire corrected to Laquire. Humm! Saquire and I had Sequin all along. So I went on the Lecuyer trail. Cold trail too. Then I decided to go through the Vermont vital records for Laquires. I found out that some were living in Ferrisburgh very near the families I knew from the Tourvilles’ circle of family and friends. Interesting. I looked through the Vermont Vital Records and found a Matilda Laquire married to a Lewis Covill (my second scream of the day). Remember that sometimes the Tourvilles were also called Courville in various catholic church records. Matilda was the daughter of Mitchell Laquire and Mary German. I found two other marriages for children of Mitchell and Mary German. I could not find the family in censuses. They obviously came to the States after 1850 and the 1851 Canadian Census record for their parish were lost. I did find Matilda, living alone in 1860 in Vermont. As the Laquire trail went cold also, I decided to go through the Germans. Hummm! Was it German for Lallemand, a French surname here? Nope. It was for Germain or St-Germain. So with a lot of research I did find the St-Germain in Quebec and in St. Mary’s Catholic Repertoire of Burlington. And there it was: Lequin. The name in Quebec was Lequin or Lequien. After that, it was so easy. Michel Lequin married Marie-Louise St-Germain on November 3, 1840, in Marieville, Québec. Mathilde was born May 13, 1847 in Mont-St-Grégoire. Michel died in Farnham in 1855, the record states he was living in the United States. Mary German may have remarried in Vermont but no trace of her after that. As I mentioned before, the last trace of Matilda Laquire Tourville was in 1886 as she was the witness at Clarissa’s marriage. I will never give up. I am pretty sure that one of these days I will find her even if I have no trace of her death in Michigan, Minnesota or even Vermont. And of course, I looked for siblings’ obituaries. No such luck. But my biggest break was this: while I was looking at the Vermont vital records index on microfilms in Montreal, I saw a child named German, father was Joseph German and the mother was Nettie TOURVILLE. Who was that Nettie?! I suddenly remembered that years ago someone gave me the name of the children of Charles and Sophia Arpajou from the Clarence Tourville Book and that Sophia (married to Joseph Giguère as I proofed later) was mentioned as being married to a Joseph St-Germain. I never found the couple and as later I found the name of Joseph Giguère, I thought it was a simple mistake. Yeah, MY mistake. Who was that Nettie? The answer in post #15 coming soon! 52 Ancestors / 52 Weeks is an idea proposed by Amy Johnson Crow. Link on the image for more details about it. Charles Tourville and Sophie Arpajou had eight children who made it to adulthood, four sons and four daughters. 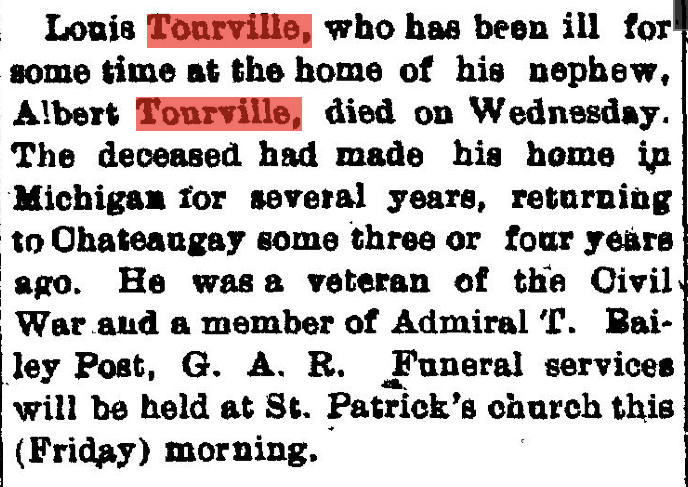 Let’s continue with one of their sons, Louis Tourville, a Civil War veteran. Louis was born on September 30, 1844 and baptized 6 days later, on October 6, in St-Hughes, Québec. His father Charles was absent at the baptismal ceremony which led me to believe that he was perhaps working in Addison County while Sophia was waiting for Louis’ birth at their house in St-Hughes. As I explained in previous posts, it seems that around 1850 Charles, then a widower, went on to live with his sister Catherine, brother-in-law and nephews in Chateaugay, NY to get some help from Catherine to raise the younger children. By the end of 1851 or beginning of 1852, we can assume that both the families of Louis’ siblings, Charles Jr and Sophia, moved to Chateaugay after living a few years in Addison County, VT. His brother Joseph and sister Julia seemed to have spent all their lives in Clinton or Franklin Counties after their mother’s death. A decade later, around 1862-63, two other siblings, Peter Stephen and Philomena, also moved from Vergennes, VT to Franklin County, NY with their spouse and children. Nettie will be the only one who will stay permanently in Vermont with her family. What about Louis? In 1860, he was living in Vergennes within the household of a lawyer. According to the census, at age 15, he attended school during the year which is a little bit surprising to me. Was he working there as a servant as well? Because another boy in the same household was a servant and had also attended school that same year at age 17. Maybe there are some research to do about that lawyer, George W. Grandey. We know for sure that Louis was educated because he knew how to sign his name. One year later, on September 6, 1861, Louis enrolled in the Civil War. He was mustered in on September 20, fighting with Company F, in the 2nd Regiment of Vermont. Some hints about his appearance: he was 5′ 6″, had black hair and dark eyes. You can read the organization and service of Louis regiment here. He survived the Battle of Gettysburg, PA, which occured July 2-4, 1863. He was mustered out on December, 20,1863 but re-enlisted the following day at Brandy Station, VA. He was wounded from a musket gun shot in the right thigh at the battle of the Wilderness, VA, on May 5, 1864, which lasted 3 days. The ball entered on the inside about 6 or 7 inches above the knee joint and exited nearly opposite its entry. He was admitted at Campbell General Hospital, in Washington, D.C. on May 11, 1864. On May 16, 1864, Louis was furloughed. He returned to duty on August 1, 1864. He was struck in the left thigh by a piece of an exploded shell at the Third Battle of Winchester, VA, on September 19, 1864. He was hospitalized in Montpelier, VT General Hospital and during the following months he is listed as present at the Fort Wood Station, on Bedloe’s Island, in the New York Harbor. By November 1864, he was back with his regiment. He was promoted Corporal on January 1, 1865. He was mustered out with the rest of the regiment on July 15, 1865, in Washington, D.C. although some papers in his Pension file also mentioned July 20 as his discharge date. Shortly after his service, on September 20, 1865, Louis married Matilda LaQuire (or Lequin in Québec) in Ferrisburgh, Vermont, before a Methodist minister. Matilda was no stranger to Louis as she was the cousin of Joseph St-Germain, his brother-in-law. The couple quickly moved to Chateaugay, NY as Matilda gave birth there to daughter Mary Jane on December 6, 1865 and baptized on January 1, 1866 at the local St. Patrick’s Catholic Church. You people out there did notice the dates and did the math. I suppose that Louis did her a favor. I have no proof that he was back in Vermont nine months or even seven months before the birth of Mary Jane. I also noticed that Mary Jane stated her birth year as 1866. She was probably told that she was born in 1866. You can change a birth date but not the timeline of the Civil War. At the end of the summer of 1868, the couple welcomed another daughter, Lizzie. A few months later, the family moved to Grand Haven, MI. On August 19, 1869, Lizzie died at age 1, from teething. On December 23, 1869, a third daughter was born, Clarissa. I know from various Grantor/Grantee Indexes that a land was purchased from Louis in 1866, 1868 as well as in 1872 in Chateaugay, NY but I haven’t seen the documents. Only very recently have I found the birth of another child, George, who was born on March 17, 1872 in Ferrisburgh, VT. He was baptized 4 days later at the Charlotte Catholic Church. I think there is a possibility that his brother Peter Stephen was living on the land as it was sold to Peter by Louis in 1884. The family probably returned to Grand Haven shortly after George’s birth. I tried everything to find Louis and Matilda in the 1870 US Census in Michigan without any luck. Same thing for Louis sister’s Philomena and her husband Dwight Daniels who also lived in Grand Haven at the same time.They were left out. According to the 1880 US Census, Louis was living in Grand Haven, working in a livery stable, with his wife Matilda and their two daughters, Mary and Clarissa. So his son George either died in Vermont or in Michigan. On January 1, 1883, Louis’ name appeared in the 1883 Michigan Civil War Pension Roll as a resident of Grand Haven. Also the Grand Haven G.A.R. Post #75 1883 List states that he was a sailor. His daughter Mary Jane was married in 1883 to Marinus Kamhout and his daughter Clarissa was married in 1886 to Edward Palmer, both in Grand Haven. Clarissa’s father-in-law, Philander Palmer, a physician, was also a Civil War Veteran and was a member of G.A.R. Post #75 with Louis. Clarissa is high on my “Missing People” list. Edward Palmer married his second wife in 1892 but I have no idea what happened to Clarissa. In fact, Clarissa’s marriage is the last trace I found of Matilda as well as she was the witness for the bride. By 1886, Louis moved to Minneapolis, MN. He occupied all kind of jobs there: hackman, laborer, hostler, groom, teamster. For a time, he was working at E.C. Butts & Sons. E.C. Butts was a native a Vermont and had also a business in Grand Haven. I often wondered if Louis left Grand Haven because his wife died. Or had he left with her and she died in Minneapolis? Or has he simply left his family? A questionnaire sent to the veterans in 1898 concerning the family members of the veterans only states: “Wife dead” written by Louis’ hand. No mention of his daughters. By 1896 Louis was back in Grand Haven as he was working as a porter at an hotel there. In 1907, he declared that he then lived in Chateaugay, NY. His name is not in the 1905 NY State Census so we can assume he came back to Chateaugay around 1907. We found him there in 1910, living with his nephew Albert. 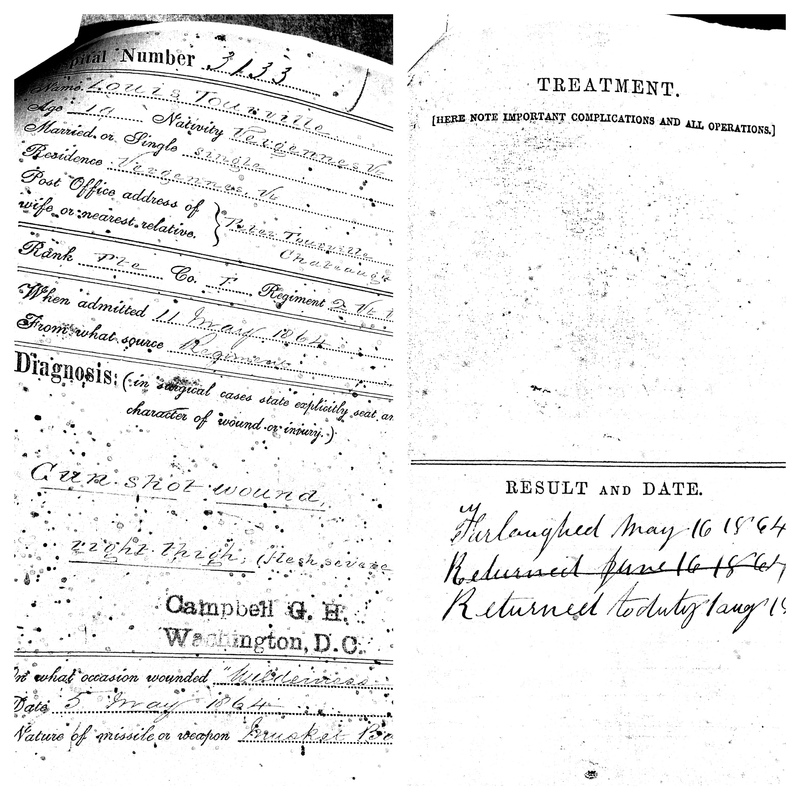 In order to receive his pension, Louis had to go through a biannual medical exam from what I gathered.The first one was in Malone, NY in 1867. The doctor declared him one half incapacitated and the disability was permanent. Louis complained of rheumatic pains in the leg which became aggravated after much fatigue. The next exams were in Grand Haven, MI, in both 1873 and 1875. In 1877, the exam was made in Grand Rapids, MI. The later exams were in Minneapolis in 1890, 1891 and 1892. His pension was first at the monthly rate of $4, then went down to $2. He did challenge the amount but he had to wait until 1907 to get a monthly rate of $12 due to his age (over 62). His medical reports also showed his weight gain. From 145 lbs at age 29 to 165 lbs at age 45. Louis died on March 27, 1912 in Chateaugay. At the time, he was living with his nephew Albert Tourville. He was buried in St. Patrick’s Catholic Cemetery, in Chateaugay, NY. All these long trips accross the country and he died where he grew up as child. Charles Tourville and Sophie Arpajou had eight children who made it to adulthood, four sons and four daughters. Let’s start with one of their daughters, Philomena Tourville, born in Vermont in 1841. The first time I saw the name of Philomena, it was in the St. Patrick’s Church records, from Chateaugay, NY. It was for the baptism of Maria Clara Bauchemin, with the sponsors being Joseph Tourville (perhaps her brother or nephew) and Maria Gillier (her niece). I endlessly looked for clues for the whereabouts of Edward Bauchemin and Philomena Tourville and could not find anything. And of course, I had the confirmation that Philomena was a child of Charles and Sophie from the inventory after death taken in October of 1851. What puzzled me for a long time is that she was not mentioned in the 1850 US Census. It was only when I found her baptism last year that I realized that the Meranda Tourville living with Charles Tourville Jr was in fact Philomena. On the other hand, many years ago, I read on a Genealogy Forum that a Mr. Daniels was desesperately looking to find the ancestry of his GGmother called Mary Tourville married to Dwight Daniels. He knew that Mary could not speak English, that Dwight was born in Vergennes, Vermont, that their first-born William was from Vermont but that they later moved to Westville, NY where John was born. He also mentioned that the family moved to Grand Haven, MI where Dwight was working for the railroad company. When I read this, I was convinced that this “Mary” was “Marie-Édesse” or “Edith” in the 1850 Census. It all made sense since she was the only girl for whom I did not find a clue after the 1850 US Census. I wrote to Mr. Daniels and told him there were too many coincidences. The Tourvilles’ lived in Vergennes and then moved to Chateaugay, NY, close to Westville. One of the son, Louis, moved to Grand Haven, MI in 1869 almost at the same time that Dwight Daniels and Mary Tourville moved to Grand Haven. He was not convinced but wrote to me that this was the best lead he had so far. Unfortunately, Mr. Daniels died a few years afterwards long before I found out more about that couple. Family Search also helped me: I found a marriage record for Edwin Daniels (born in 1870). His parents are listed as Dwight Daniels and Mary P. Tourville. There is still a mystery as to what happened to Philomena. Daniels family lore mentioned that she would have died around 1875 in Grand Haven, MI. We know for a fact that Dwight Daniels married three times. First time to Philomena (marriage still not found to this date), second time to his first cousin, Mary Barton (marriage still not found to this date). She died in 1895 in Vergennes, from consumption, death certificate indicating that she was 36 years old. His third wife was Mary’s sister, Martha Barton. I haven’t find her death yet but she was still living in 1940, with her only daughter and son-in-law, near Albany, NY. Dwight Daniels died in 1914 in Vergennes. Now back to Philomena. Maybe she hasn’t died in 1875. Because in the 1880 US Census, the wife was 40 years old (Mary Barton was only 21 years old in 1880). The fact that Mary was said to be born in Canada (we know she only spoke French). Unfortunately I have never found the death date of Philomena. We know for sure she died before 1895. The question is: when did Dwight Daniels come back to Vergennes? In his obituary he is said that have lived in Vergennes all his life except a few years in Chicago. What about the children? So many mysteries. William, born in 1859, in Vermont came back to New York State, he lived in Salamanca. He was married to Anna McCann (date unknown). He is sometimes mentioned as being born either in Vermont or Michigan. He died in 1914. John, born abt 1863, in NY, is “missing” since the 1880 US Census. Clarissa, born in 1865, in NY, was a nurse at Asbury Hospital for many years. Where? Was she married? No clue. According to family lore, shed died about 1932. I may have found her living in Duluth, Minnesota in the 1885 State Census. Benjamin, born in 1867 in MI, left the family very young after the death of his mother as he didn’t get along with his father who was mean to the children. Made his life in Minnesota and died there in 1935. Edwin Dwight, born in 1870, married twice (1891 and 1904). He supposedly died in Chicago around 1944. I have never found him in any censuses after 1880 but I did find him in Directories in Detroit (1891 to 1894) and Chicago (1897). I did find an article on him in 1892. He was arrested with his brother-in-law for arson. Alfred, born in 1878 (to the first wife, or second wife? ), died supposedly from a bonfire around 1881. Philomena is the only child from Charles and Sophie from whom I haven’t find a death date (except for children who died in infancy). I will not give up!